Great guns need great accessories. Like products from US PeaceKeeper, manufacturers of nylon products with exceptional quality and pricing, plus a lifetime warranty. From cases to packs, range bags to shooting mats, US Peacekeeper products are not manufactured solely for style and price point, but designed for durability. In a market full of nylon gear, US PeaceKeeper strikes the balance in price and affordability. Our 52" Drag Bag is unequaled at securing and protecting your precision rifle. 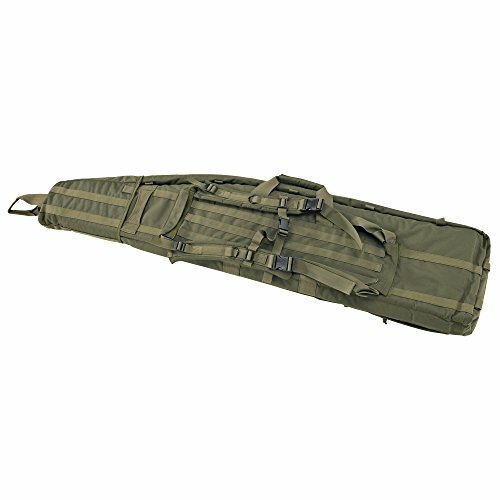 With 3" padding, secure webbing system, an integral hood for additional muzzle protection, multiple accessory pockets (including one specifically designed for one-piece cleaning rods), wrap-around handles, drag handles, padded backpack straps for additional carry option (including a hidden pocket for these straps when dragging the bag), and a snapped flap to protect zipper from dirt and moisture, no other case offers such dependability and versatility. Hidden pocket for backpack straps; Three front accessory pockets: 23" x 9" x 2"; 11.5" x 10" x 2"; 11.5" x 10"
Two interior pockets - Accessory Pocket: 13" x 5" x 1" & Cleaning Rod Pocket 43" x 1.75"
If you have any questions about this product by US PeaceKeeper Products, contact us by completing and submitting the form below. If you are looking for a specif part number, please include it with your message. IWI US, Inc Tavor Complete Case, Black, 32"
Boyt Harness Rifle Case, Taupe, 48"
Skb I-Series M4 Short Case Dt 36"